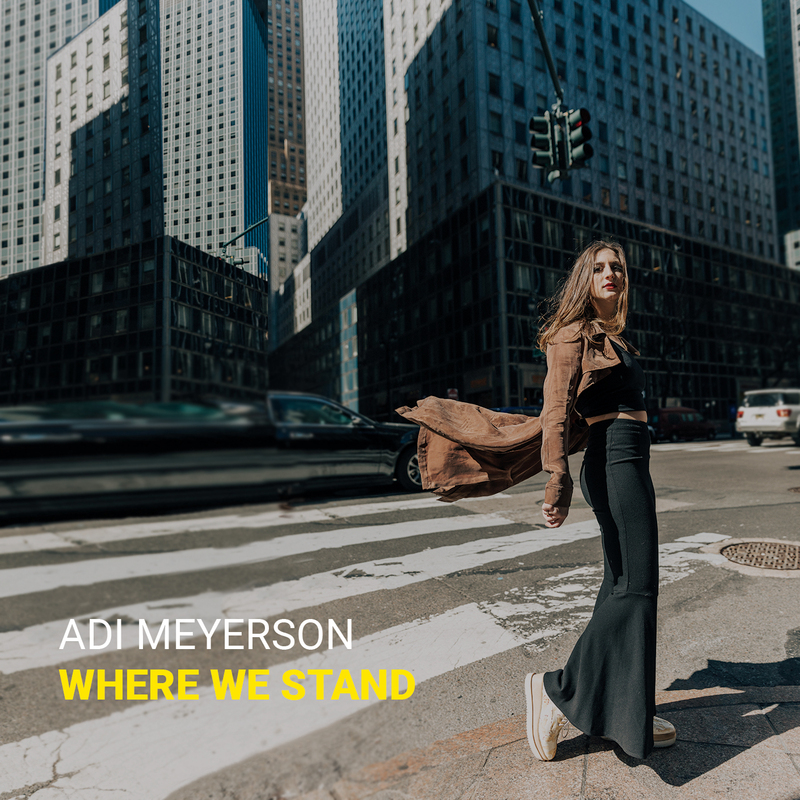 Jazz Station - Arnaldo DeSouteiro's Blog (Jazz, Bossa & Beyond): Instrumental Jazz CD of the Month - "Adi Meyerson: Where We Stand"
Instrumental Jazz CD of the Month - "Adi Meyerson: Where We Stand"
Bassist and composer Adi Meyerson is proud to announce the June 5th release of her debut album "Where We Stand." Alongside the distinct stylings of special guest vocalist and guitarist Camila Meza, the CD features stalwart tenor saxophonist Joel Frahm, trumpeter Freddie Hendrix, pianist Mike King and drummer Kush Abadey. Where We Stand, signified by the title track, and as a whole, represents times of uncertainty and change. Through this dynamic music, Meyerson displays how these particular moments, although unpredictable and ambivalent, can sometimes also carry a feeling of excitement and anticipation. For Meyerson, the album title feels relevant to her, both as an individual and as a part of the current social climate we all live in today. Adi Meyerson’s nine-track opus is at once reflective and celebratory. 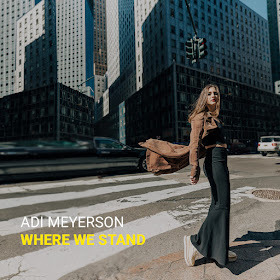 Written over half a decade, "Where We Stand" takes its inspiration from Meyersons’ five years living in New York City, where she has established herself as a staple on the downtown scene. Although difficult to pinpoint specific experiences that inspired these compositions, Meyerson knows that every day and every encounter somehow found its way into the music. While “A “D” Train”, written on a flight back to NYC was interestingly given its name as a clever way to help people pronounce the composer’s name correctly, the opening track off the album “Rice & Beans” was written while Meyerson sat on a beautiful beach in Manuel Antonio in Costa Rica. “TNT” was written with some of Meyerson’s closest friends in mind, while “Eunice” was composed for Nina Simone, after the bandleader became inspired by the legendary vocalist’s life and personality. Similar to “A Touch of Grey”, “Holes” and “Unfinished Business”, “Little Firefly” is dedicated to all the people on this planet that left before it was time for them to go. Although it is the oldest song out of the nine tunes that Meyerson wrote, it became one of the most relevant compositions throughout her life. Featuring Camila Meza on vocals and guitar, “Little Firefly” was also the bassist’s first experience with lyric writing. Written two weeks before recording, the title track of the record became a new door to a new period, musically. The New School for Jazz and Contemporary Music graduate is thrilled to be joined by this ensemble, who collectively bring her vision to life. Each of these musicians have a unique sound that skillfully and appropriately interprets the music. While Meyerson appreciates the strong, lyrical and energetic frontline of Freddie Hendrix and Joel Frahm, she also admiringly acknowledges both the sensitivity and fire that Kush Abadey and Mike King contribute to the rhythm section. Special guest Camila Meza adds a distinctive flair that brings this ensemble together. While the accomplished vocalist delivers the title track with sincere emotion and dynamic, Meza also exhibits her versatility and elegance on “Little Firefly”. Upon hearing Meza over three years ago, Meyerson immediately knew she was the perfect person to sing the track. In addition to her New York City chronicles, "Where We Stand" also serves as a celebration of life in honor of her late father. Following his untimely death, Meyerson turned to writing as a way to cope. She explains, “it helped me to acknowledge that life goes on and that positive experiences are still part of it.” While this album documents Meyerson’s life experiences throughout the past five years, "Where We Stand" is an album that is very much about the music as a whole. While showcasing each musician in the band, Meyerson simultaneously ensures that the music actively maintains a cohesive collective sound that presents each individual song to the highest standard and authenticity. Adi Meyerson received her first musical training at the prestigious “Charles A. Smith Jerusalem High School of the Arts” on bass guitar at the age of 14. After graduating from high school, Adi started playing the upright bass in the search of a new sound that was more appropriate for Jazz. Three months later, Adi was accepted to the prominent collaborative program between “The Center of Jazz Studies (CJS)” at the Israel Conservatory of Music and “The New School for Jazz and Contemporary Music”. There she had the Privilege to study and play with some of Israel’s finest musicians such as Amit Golan, Amos Hoffman, Ofer Ganor, Danny Rosenfeld, Erez Bar Noy, Yuval Cohen and many others, as well as the opportunity to carry out the equivalent with international jazz legends such as Jimmy Cobb, Mulgrew Miller, Peter Bernstein and Eddie Henderson. In August 2012 Adi moved To New York to continue her studies at The New School for Jazz and Contemporary Music, where she graduated from in 2014. She received an opportunity to study with some of the great masters of the style such as Reggie Workman, Ron Carter, Charles Tolliver, Kirk Nurock, Billy Harper, Bob Cranshaw and many more. Since moving to New York, Adi has played with many local greats such as Joel Frahm, Joe Magnarelli, Steve Nelson, Charli Persip and many others around NYC venues such as Mezzrow, Smalls Jazz Club, Fat Cat, Smoke Jazz, Minton’s, Zinc Bar, Dizzy’s Coca Cola, and others. She has recently toured the US and Central America and recorded with the Champian Fulton band for Positone Records. Adi also leads her own band, The “Adi Meyerson Band” and performs regularly in NYC and the east coast.